Repaying student loans isn’t anyone’s favorite task. And it’s possible you could have numerous loans with varying interest rates from different lenders, meaning you have to make multiple payments. If you are in grace or repayment on one or more private or federal student loans, Dupaco can help make your loan repayment less stressful. With our student loan refinance option from CU Student Choice, you'll be able to consolidate your existing private or federal student loans, including PLUS loans, up to $125,000, into one manageable loan with a local lender you can trust, and potentially lower your rate. Remember: if you refinance your federal student loans, you may lose certain borrower benefits from your original loans. These may include interest rate reductions, principal rebates, or some cancellation benefits that can significantly reduce the cost of repaying your loans. See disclosures for full details. 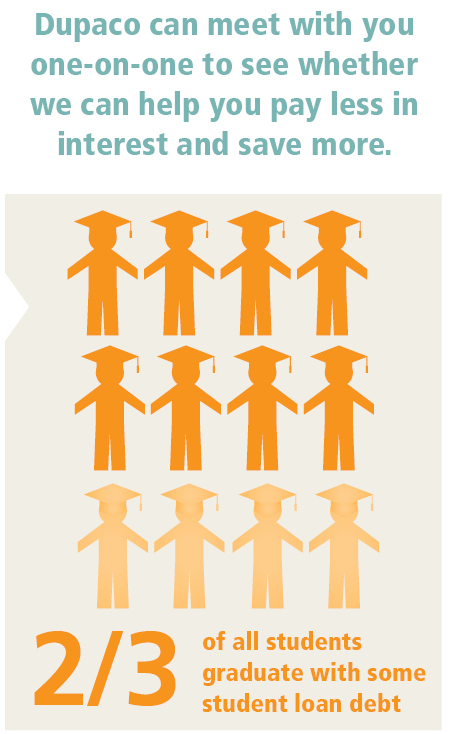 Who is eligible for student loan refinance? U.S. citizens or permanent residents who have graduated from an approved public or private not-for-profit school. If you are considering refinancing your student loans, learn more and see current loan rates, or apply for our Student Choice loan consolidation below. For more information, contact our loan department at loans@dupaco.com or 800-373-7600 / (563) 557-7600, ext. 202.